A bit overcast as we pack up and get ready to leave Barge. Although we like the area--both the cities (Cuneo, Saluzzo, even Pinerolo) and the countryside -- green and framed by the Alps (sometimes visible) and the food and wine are great, we are ready to leave Barge and the Alter Hotel which have not been as appealing as the rest of the area. The route to Casale Monferrato (in the eastern part of Piemonte) takes us over the same route we took yesterday when we went to Bra, then goes through Asti (which seems enormous as we drive right through the middle of it) and then into the greener, rolling hills of the Monferrato area. The sun had been out but now the sky is threatening as we pass the hill town of Moncalvo and reach Casale Monferrato, located on the south bank of the Po River. We are staying at a small b&b located in an apartment building on a side street in the "centro storico". We unload the luggage and meet the very friendly and enthusiastic owner, Alessandra who shows us to our room. The room is a neat, small "junior suite" with a separate sleeping area, couch and dining table. I then go and park the car in large free parking lot just around the corner in the Piazza Castello. The sun has now come out and we ask Alessandra about a place for lunch. She sends to a sweet informal restaurant a couple of blocks away where we greeted warmly by the staff and have a very tasty lunch (two pasta dishes). We take a short walk around town after lunch to get our bearings and return to the room as the sky begins to cloud over. Later in the afternoon the rain has let up and we go out together. In the streets, we notice many women carrying roses and as we continue to walk, we get to the source. 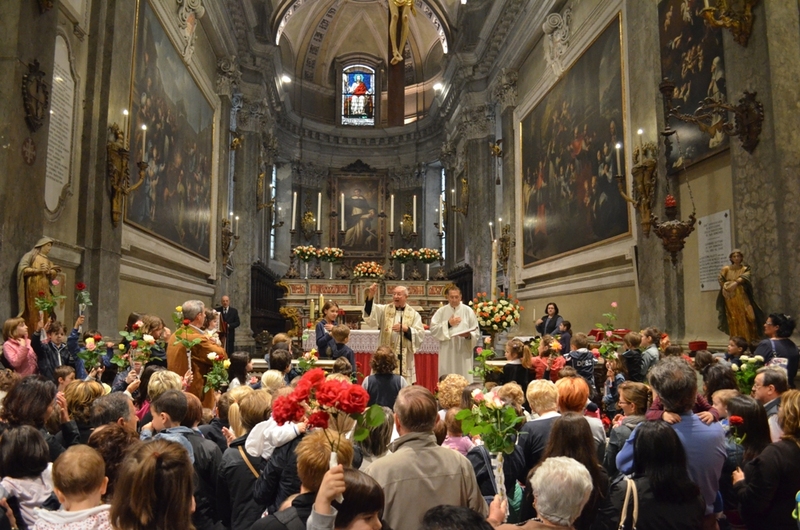 Today is the celebration of St. Rita of Cascia at the Church of San Domenico and there is an entire day of programs, activities and masses. St. Rita lived in the 15th century in Umbria and was in an abusive marriage. After her husband was killed, she joined a religious community and is now the patron saint of impossible causes, abused wives and widows. One of her attributes is the rose which explains the abundance of roses in evidence on this day. We sit in the church for the end of the blessing of the children and the beginning of a mass....we have rarely seen a church as crowded as this one is today. We have dinner at an oddly named restaurant--Cicinbarlichin. I confess that I don't ever find out what the name signifies but dinner is a success. The restaurant is nicely decorated and is pleasantly busy. What we ate has slipped from our memory but we do remember that, when we ask for the wine list, the waitress leaves and a man appears saying that "he is the wine list." He recommends a Barbera from Asti (he prefers that to the local version) which is delicious. We are becoming big fans of Barbera on this trip. It is a pleasant walk back to the hotel through the back streets that are lit by antique street lights...the walk back reminds us of similar walks in Lucca. We are feeling very positive about Casale Monferrato.